The smile is the most beautiful way to show your teeth. Having healthy and beautiful teeth increases the feeling of well-being and self-esteem and improves your charm in private and professional life. For this reason, currently dentists and oral surgeons plan very accurately the replacement of lost teeth and the best treatment of the diseased teeth in order to give back the quality of life related to them. The interventions of bone reconstruction are able to ensure your teeth function and beauty. To this end, your dentist can use natural materials designed and tested for many years and are very well tolerated. Bone loss can be due to multiple causes – for example, an accident or an inflammation of the gums and the bone of the jaw due to bacterial plaque (periodontitis). Even after the extraction of a tooth height and the thickness of the bone can be reduced due to the absence of mechanical loading. An adequate bone volume is, however, essential to ensure the long-term stability of teeth and implants. It is also essential to ensure the health and aesthetics of your teeth and gums. Under what circumstances is required bone reconstruction? To support and increase the bone when inserting a dental implant, if the amount of existing bone is not sufficient to ensure a stable anchorage of the tooth in the long term. To preserve existing teeth that have lost a safe anchorage to the bone due to periodontal disease (also called periodontitis or periodontal disease, caused by bacteria). Bone reconstruction after extensive bone loss. To correct a bone defect in the posterior region of the upper jaw (maxillary sinus area). In order to rebuild the lost bone after resection of a root or a cyst. To preserve the bone and the appearance of the gum after extraction of teeth. As you can rebuild bone? Human bone has the ability to regenerate, in other words, to rebuild and repair the missing bone. In most cases of oral regeneration, however, requires a support. Natural products Geistlich Bio-Oss ® and Geistlich Bio-Gide ® drive the bone regeneration process of the patient in an extremely effective. The bone undergoing training requires a scaffold to act as a guide for the regrowth. The biomaterial for bone replacement Geistlich Bio-Oss ® meets this need perfectly thanks to its extremely porous. In order for bone regeneration can take place without problems, a membrane (Geistlich Bio-Gide ®) is positioned above the area of ​​bone regeneration as a protective barrier in order to prevent the rapid regrowth of the gingival tissue goes to invade the space that should be occupied bone, which has a much slower growth. In addition to protecting the wound, the Geistlich Bio-Gide ® promotes optimal healing. What are Geistlich Bio-Oss ® and Geistlich Bio-Gide ®? Geistlich Geistlich Bio-Oss ® and Bio-Gide ® are natural products. Due to the high similarity with human tissue, these materials are optimal to support the formation of new bone and tissue healing. They integrate during healing and are gradually degraded by their metabolic processes of the human body. These processes may take several years to Geistlich Bio-Oss ®, while Geistlich Bio-Gide ® is completely metabolized after a few months. Geistlich Bio-Oss ® is made ​​of only the bone mineral of Australian cattle herds. In every stage of production the organic component is removed and remains exclusively the bone structure composed of elements of football. Geistlich Bio-Gide ® is a membrane of highly purified porcine collagen. In the human body the collagen protein is the main component of the skin and connective tissues. The natural protein structure of Geistlich Bio-Gide ® promotes healing and allows for optimal bone regeneration as a barrier protecting the wound. Bone reconstruction and implant placement takes place in the same session. system exposed due to the lack of bone mass. Filling the bone defect with Geistlich Bio-Oss ® to form new bone mass protection of which, the wound is covered with the Geistlich Bio-Gide ®. 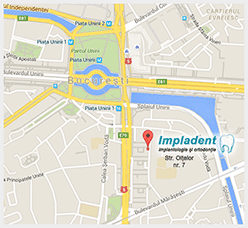 The dental implant is inserted only after bone reconstruction is complete. filling the defect with Geistlich Bio-Oss ® to form new bone and cover with the Geistlich Bio-Gide ® to protect the wound. The dental implant is inserted once the rebuilding phase bone. Reconstruction bone serves to stabilize the tooth. is a flaw bone caused by periodontal disease. filling the defect with Geistlich Bio-Oss ® to form new bone and cover with the Geistlich Bio-Gide ®.